This time of the year is always the same, at least in the Northern hemisphere. Everyone’s happy that the days are getting longer and the snowdrops are starting to bloom, there’s just the slightest scent of spring in the air and there are hearts everywhere you look. Hearts, hearts, hearts, hearts, hearts. It makes me tired just to think about them. I’ve never been a fan of Valentine’s Day, mostly because I didn’t see what purpose it serves (you only show someone you love them once a year?? would ask a child version of me) and because of all the pink. I’ve had a hate/hate (no love, sorry) relationship with pink my whole life. Why must little girls wear bright pink clothes and accessories? Why must you paint that pink? Why, oh why, would you not listen to your better judgement and leave that fluorescent pink in the darkness, where it belongs? I used to be very vocal about it and I’m lucky that my mom never forced me to wear pink (I would have probably had a meltdown… or ten). As an adult, I don’t care any more. I still don’t like it and would never buy anything pink on purpose, except if it’s the only thing that fits and was made for that specific purpose (cue in my collection of pink sports blouses that I cannot find in any other color – do all women have to look like pansies and poppies when they exercise?). But getting back to the hearts literally on every street corner, I never loved those either. I’m quite literal and rational and have known since I was a little kid that the heart is just a pump for blood and that most emotions originate in the brain, so I was never impressed by the “romantic” (not truly romantic, but let’s leave it at that for the time being) symbolism of the heart. It’s an organ, it’s not even pretty, it can be really ugly, especially if you’ve smoked all your life. Don’t ask me how I know that (ahem, forensic TV shows). But it’s still a symbol of love (maybe because it beats faster when you’re happy?) and a symbol of pain (being heartbroken literally hurts in some cases) and I have this fluffy pink yarn that for some reason I bought at the same time as the others, for variety, I told myself. 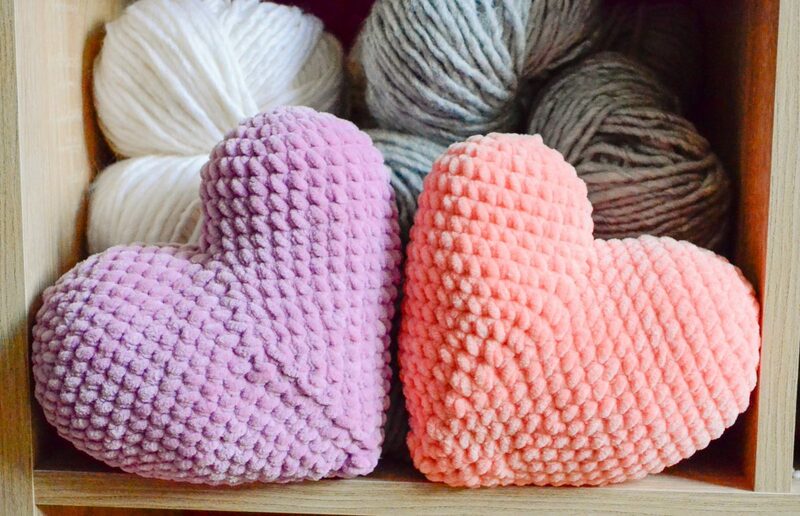 This holiday is coming up and my Instagram feed is filling up with heart-related projects. I wish they were heart health-related projects, but that’s just me, thinking of the pump again. 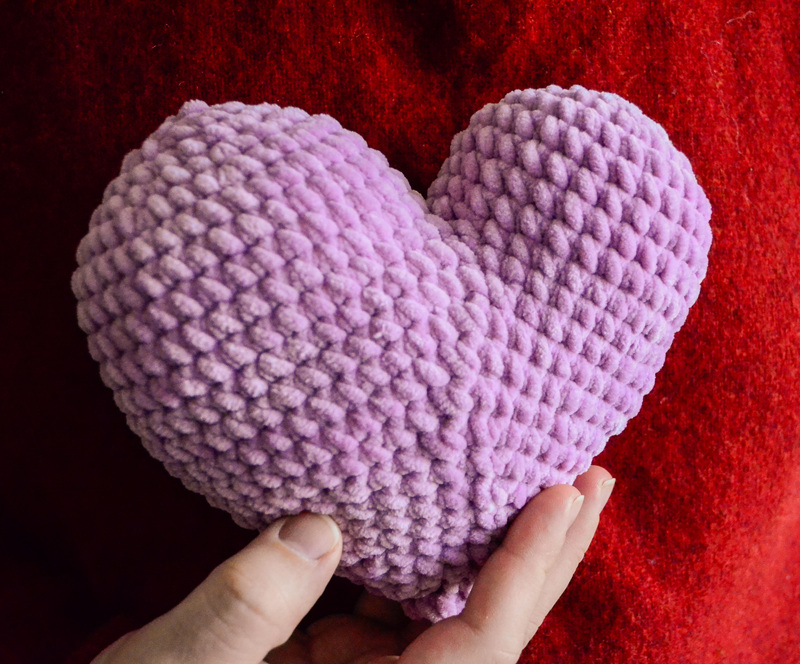 I was foolish enough to answer @therookiehooker’s question about any Valentine’s related projects with an excited “I’ll make a heart-shaped pillow in velvet yarn!” (I wasn’t actually that excited in the comment, that’s the current interpretation, let’s leave it at that). I underestimated the size of the finished piece as I was making it, so it came out more like a toy. But that’s OK, because otherwise I would have made a toy out of that yarn anyway. So win-win, right? There’s also a strong message attached to it and maybe some food for thought for all of us, if you want to join me. As I was designing this in my head on my way home from work, I realized I need to make this design unique. 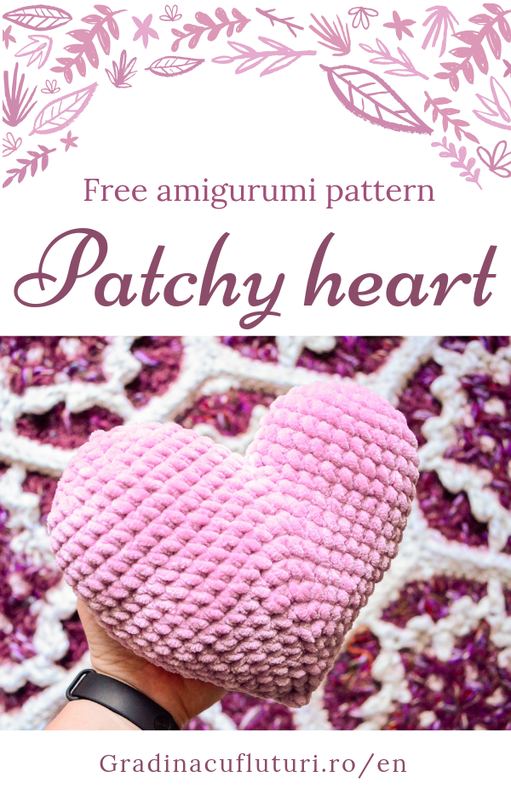 There are so many amigurumi heart patterns out there, that it’s easy to get lost while searching, although I’m not aware of any patterns created for such heavy yarn. But they are all simple, just for decoration, a gift you give someone once and then forget about it. This one can be different. 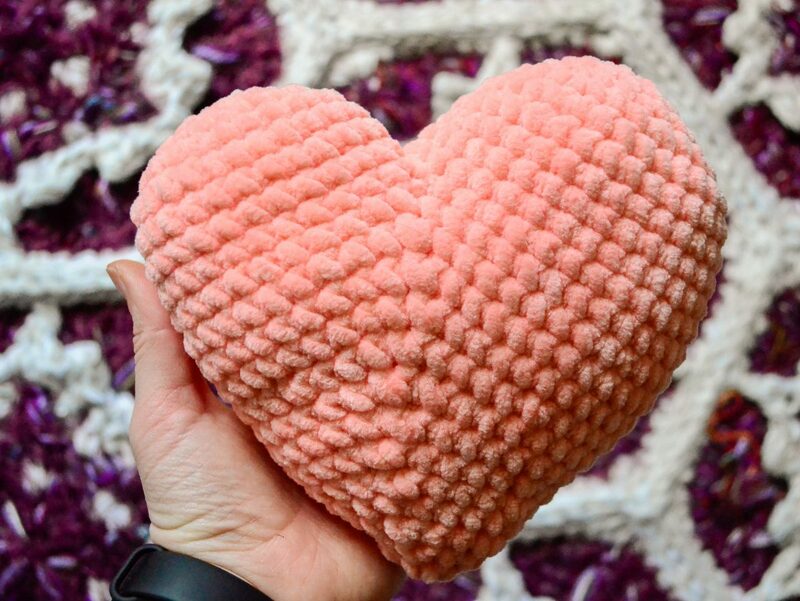 Besides the asymmetry that makes this heart more similar to the actual organ (one side is bigger, the heart rests on that side), you can add small symbols of your relationship with the human (or pet) that you gift this heart to. A patch can represent a relationship struggle that you got through together, a little trinket can be a memento of a beautiful moment spent together or a lovely place you’ve visited together. It can be a symbol filled with symbols, a meta-symbol. And you can keep it close, together, to remind you of your time spent together and the challenges that you have overcome together. It can be a gift that keeps growing as you both grow. I’m making a few of these to give to my closest friends (including my husband, who has already received his and was so sweet to accept and appreciate it). You can make one this year, fill it up with memories and make another one next year, maybe using a different pattern, or you can make one and keep adding until it’s full and then make another one. The best part about this pattern is that it works up so quickly and it’s so immersive, that you’ll wonder where the time went when you’re done two hours later. filling of your choice – preferably fiberfill – fluff it up before inserting. 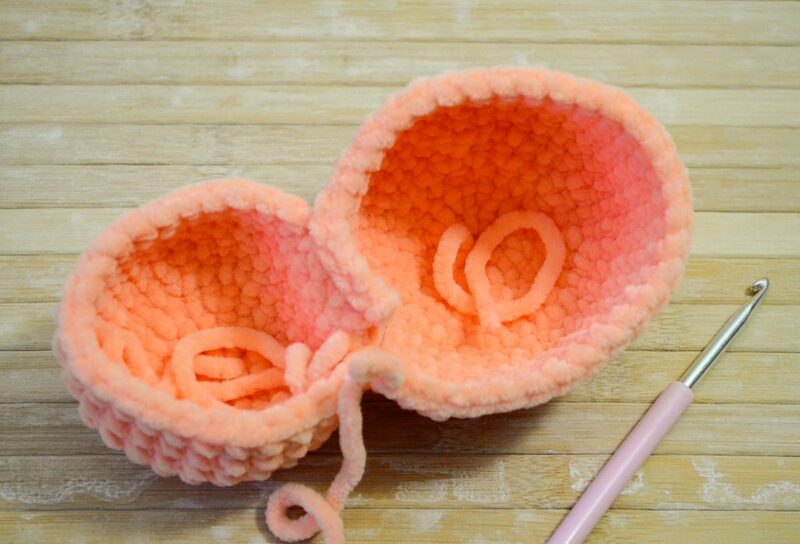 binding off amigurumi and weaving in ends – through stitches, not through filling. R 23 [dec, sc 1] 5 times (10). Stuff the remaining part, make sure there are no lumps or empty spaces. R 24 [dec] 5 times (5). Bind off. With tapestry needle, pass yarn through front loops of each of the 5 remaining st, from front to back, in each st.
Now your heart should be finished and ready for hugs. I’m working on a bigger version now, so sign up to my newsletter if you want to know when it’s published (might be after Valentine’s, but hearts are pretty presents all-year-round). If you want to see more free patterns on this website, please consider making a donation (which will probably go into yarn) and share this pattern with your friends. 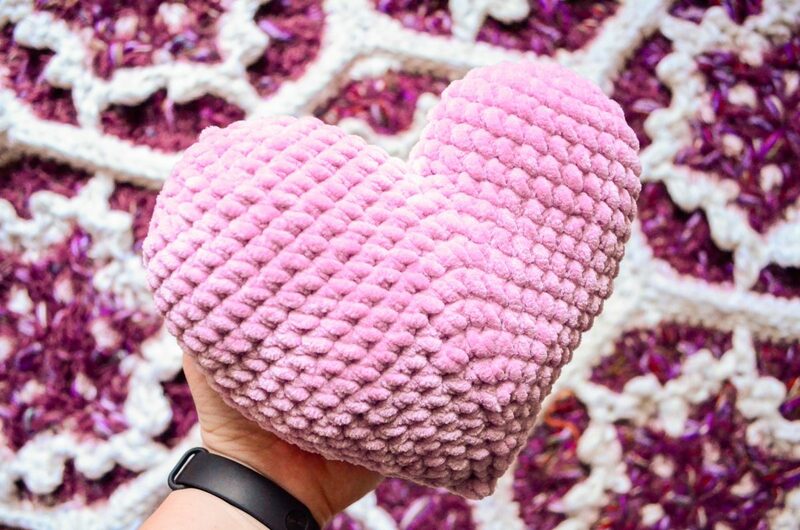 The more people you tell about this free pattern, the more beautiful and unique heart pillows and stories there will be out there. Thank you for joining me on this journey. Hope to see you next time!